With a great passion for papers, PaperThrill has been creating handmade cards with quality papers and material. As with all things handmade, no two cards are alike. And that's the beauty of handmade cards. They will work with you to ensure that your wishes and ideas are reflected on the cards. Most complimentary invitations (from the banquet venue for instance) are old-fashioned and boring. PaperThrill offers modern, more attractive designs which can be customized to suit your wedding needs. The elements in this card complements each other - the use of the satin ribbon exudes a luxurious feel, yet is balanced by the rustic feel of the skeletal leaf. The bride wanted a set of placecards to match her invitation cards as well. 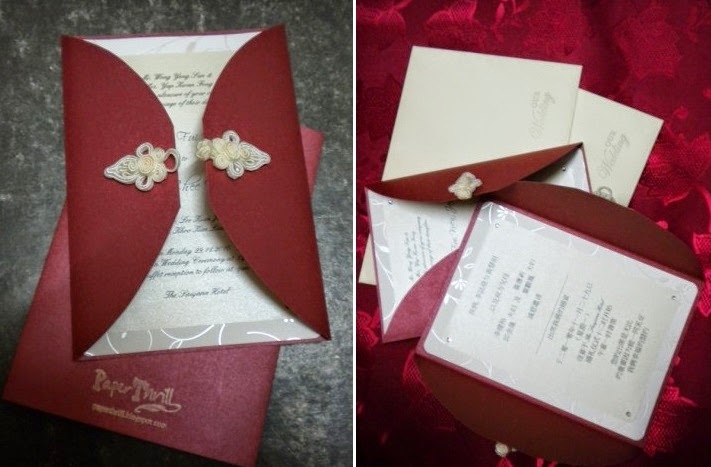 Invitation text is printed on a separate pearlescent inlay inside. This wedding invitation card comes with a damask print on both the front and back of the card. A vellum band with black ribbon wraps the front flap. A luxurious diamante buckle adorns the front of the card, giving it an extra touch of glamour. This coral pink and pearl themed invitations consist of a tri-fold pocket, with the main invitation printed on a separate card and layered in the middle section. The pocket holds two separate inserts, all double layered, thus double the thickness. The bride wanted an added elegance to her card, and so, instead of normal printing, she opt for thermographic printing. This type of printing is similar to heat embossing, giving the text a 'raised' effect. On the outside, a delicate white floral lace then wraps around the card, and a pearl bead string completes it. Browsing for card printers wasn't easy. Most card printers I found online print traditional wedding invites. One fine day I found something online which I like. clicked on the picture to find these beautiful invites and would like to engage the same printer to do my invites. I was ecstatic! It was exactly what I was looking for ! From there I found that Paper Thrill had a few modern designs which can be customised slightly to suit different wedding themes. I was soooooooooooo happy to find them! Do view their website for some samples available to choose from...if you see a particular card you like but in the wrong colour, they can easily change the colour for you and customize the cards according to your needs and requirements.